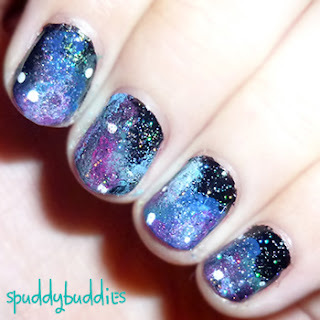 Once upon a time, I attempted to do galaxy nails but they turned out to be a flop. 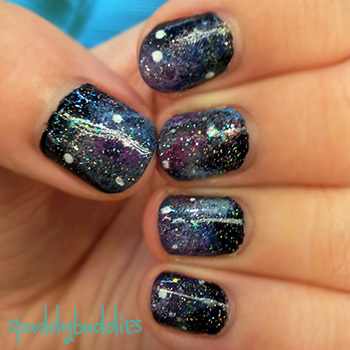 O-kay, they weren't that bad but after seeing tons of amazing galaxy nail art on other people, mine looked like unrecognizable splatters. 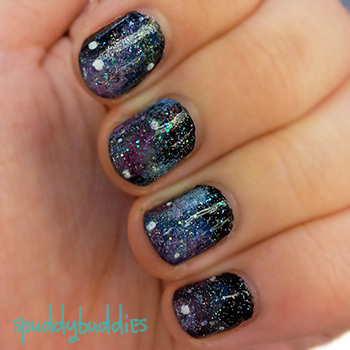 And me being me, the failed mani put me off trying it for a second time even though I'm kinda obsessed with space-related stuff and I really wanted to try doing it again. Then recently, I watched this great tutorial and decided to give it another shot. Here are some pictures before I cleaned up. Haha, the white splotches are a bit big but I like them that way. Can you say obsessed?! I'm in love with how these turned out! All I had to use was a sponge and a dotting tool. With Seche Vite, this mani lasted me 4.5 days straight with barely any chipping! I like playing around with colors so every nail had a different combination of colors sponged on. Thanks for reading and don't forget to follow me on Twitter. LOVE This!!! I don't have 60 bottles of nail polish yet but I do paint them once a week...and I'm definitely trying this next!! Stopping by from Lovely Blog Hop!! Haha thanks so much! I'm a growing nail polish hoarder. I would love to see your galaxy nails! 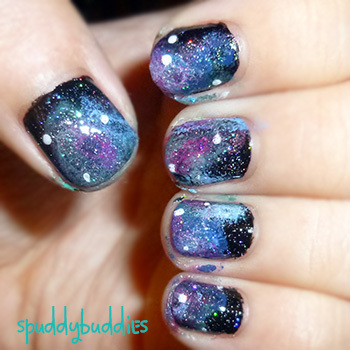 Hey, now this is such an adorable galaxy nail art. Very creative. 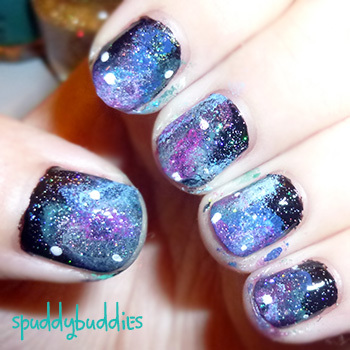 I would probably keep starring on my nails if i had that design on them :) well done. Yay, thank you!! You should definitely try these out. They were really fun to do. They are awsome! :) love them:) you are very creative. I love your enthusiasm Jennie! haha, I'm glad you love them! <3 Ah, you flatter me too much - I'm blushing. WOW. 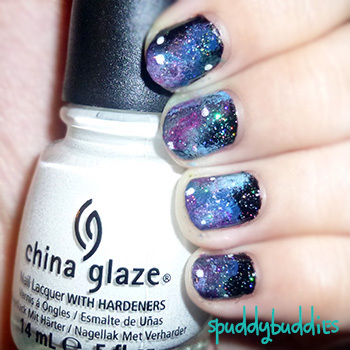 What a stunning mani!I've always wanted to try a galaxy mani, but I'm afraid I'll fail terribly lol. Yay thank you! I'm glad you like them! I remember trying them out last year and I thought they looked horrible until I put on the top coat and it was just stunning. They are just so pretty. I agree with Jennie - yours are the best I've seen!